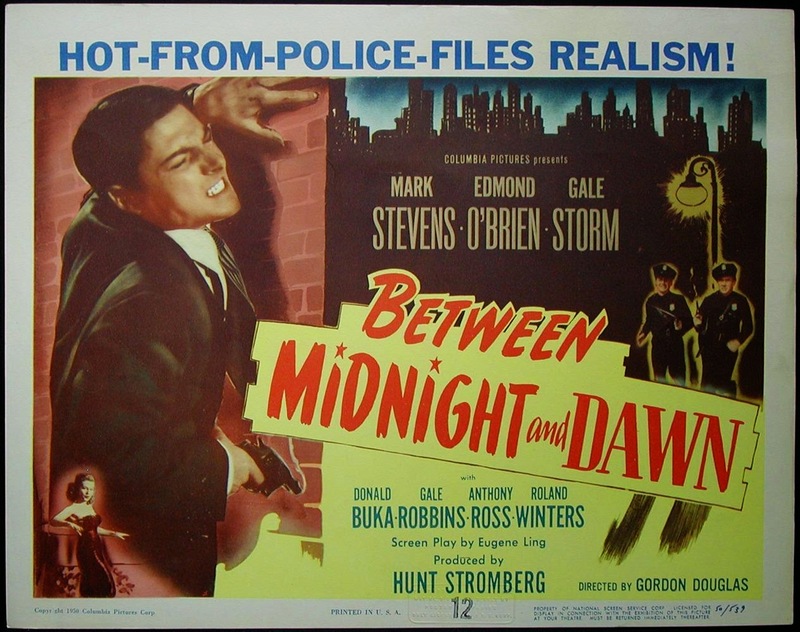 This tough-talking film seems to cram every film noir trope in the book into its 79 minutes. 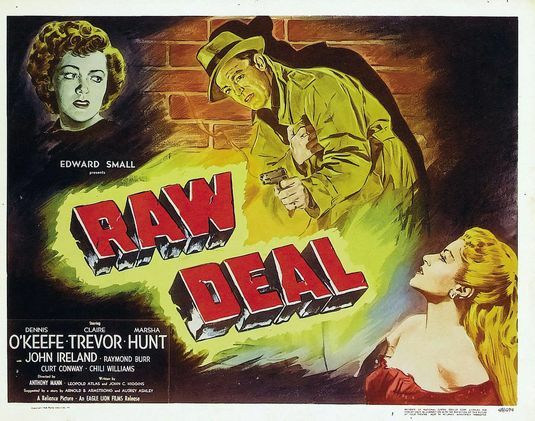 Gangster Dennis O’Keefe busts out of prison with the help of his moll ( Claire Trevor ), kidnaps social worker Marsha Hunt, and goes after the sadistic crime boss (Raymond Burr) who owes him fifty grand. Director Mann and DP John Alton make this flawed but effective ultra-low budget film work, with help from a great cast. Burr’s nasty, fire-obsessed kingpin is scary, and John Ireland as his torpedo has a great fight scene with O’Keefe. The flaming finale is well staged, but I could do without Trevor’s sporadic narration. Fun Fact: Whit Bissell (BRUTE FORCE ) has a brief role as a killer on the run. 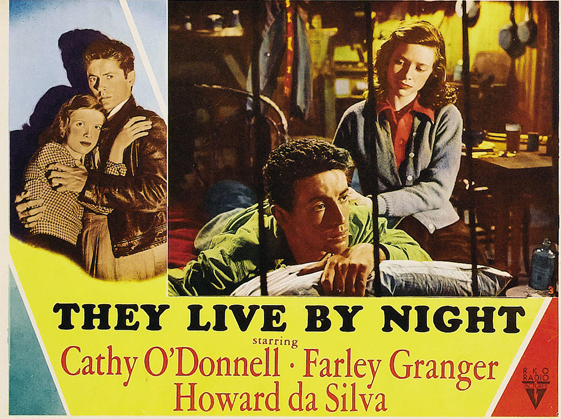 Nicholas Ray’s first film tells the tale of two young lovers (Farley Granger, Cathy O’Donnell) on the run who try to but can’t escape his life of crime. Ray’s directorial flourishes aid tremendously in making this a good, but not quite great, movie. It bogs down about halfway through, and probably could’ve used some editing, but producer John Houseman gave Ray free rein to create his feature debut. Ray would go on to direct some great films (IN A LONELY PLACE, JOHNNY GUITAR, and of course REBEL WITHOUT A CAUSE) and influence a generation of filmmakers. Character actors Howard DaSilva, Jay C. Flippen, Byron Foulger, Ian Wolfe, and Will Wright offer fine contributions, and lead actress O’Donnell gives an outstanding, subdued performance as Keechie. Fun Fact: Remade in 1974 by Robert Altman as THEIVES LIKE US, with Keith Carradine and Shelley Duvall as the young lovers. Programmer following two squad car cops (Edmond O’Brien, Mark Stevens) out to get the goods on gangster Garris (Donald Buka). The cops are also rivals for Gale Storm’s affections, and who can blame them…. I’ve had a crush on the sweet Miss Storm since adolescence! 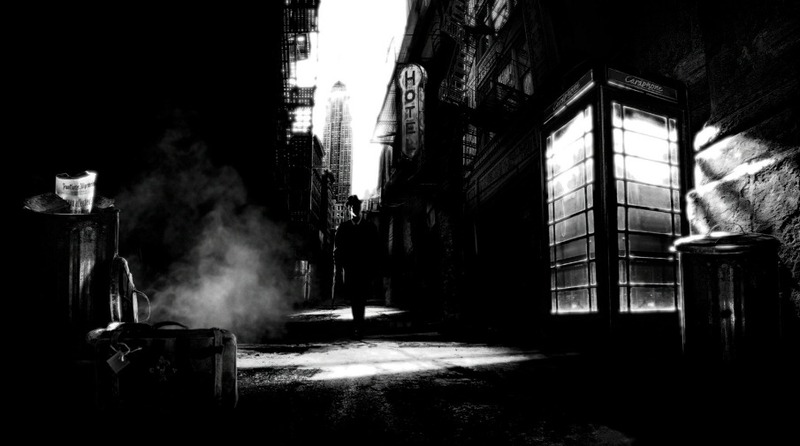 Not really a noir though it usually gets lumped with to the genre. A good cast can’t quite over come the hokey, clichéd script. Fun Fact: Be on the lookout for Madge Blake (BATMAN’s Aunt Harriet), Roland Winters (the last Monogram Charlie Chan), and Phillip Van Zandt (nemesis in countless Three Stooges shorts). You’d think a film noir with a jazz club setting would be perfect, and you’d be right… but this isn’t it (it’s 1941’s BLUES IN THE NIGHT, which I’ll be reviewing at a later date!). Mickey Rooney stars here as a jazz drummer fresh from the Korean War who gets involved with an aspiring actress ( Sally Forrest) and a gangster (Clark Gable wanna-be James Craig). The movie’s saving graces are it’s location scenes inside L.A nightclubs of the era, and some jazz numbers from legends Louis Armstrong, Jack Teagarden, Earl “Fatha” Hines, Vic Damone, and Monica Lewis (the “Chiquita Banana” girl). Otherwise, pretty disappointing. Fun Fact: THE STRIP was nominated for (but didn’t win) an Oscar for the song “A Kiss to Build a Dream On”. Red haired sexpot Rhonda Fleming and lover William Lundigan leave her husband Robert Ryan to die out in the desert with a broken leg. They think they’ve committed “the perfect murder”, but didn’t count on Ryan’s sheer willpower and McGyver-like ingenuity. 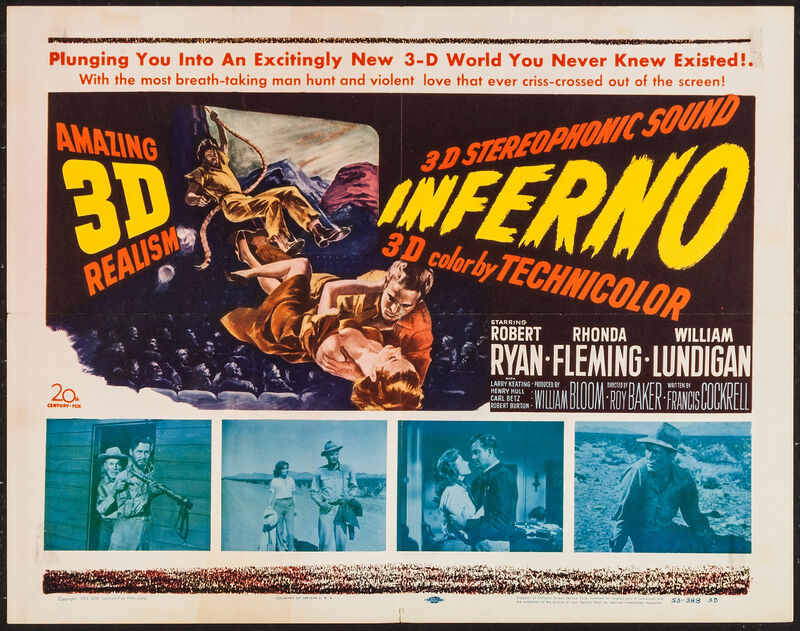 INFERNO was 20th Century Fox’s first 3-D movie (in Technicolor), and DP Lucien Ballard’s location shots in the Mojave Desert lend it a rugged feel (I would love to see this one on the big screen as intended). Director Baker also made the Marilyn Monroe noir DON’T BOTHER TO KNOCK , and went on to direct some chilling Hammer films later in his career. Henry Hull (WEREWOLF OF LONDON) appears as an old desert rat, and the climactic fight between Ryan and Lundigan in a burning cabin will definitely hold your interest, as indeed will the whole movie. A neat film about survival and revenge, well worth watching! Fun Fact: Remade twenty years later as the TV Movie ORDEAL with Arthur Hill, Diana Muldaur, and James Stacy in the Ryan/Fleming/Lundigan roles. Some films on this list I’ve never seen. Thanks for the recommendations! You’re welcome. They may not be the best of the genre or most well-known, but each film does have its moments.